Weddings are the time for experimenting along with different hairstyles and flaunting out your best styles. Each and every girl out there loves to flaunt their personality by experimenting with their look, dress, and hair of course! So, when it comes to Summer Wedding Hairstyles, the brides should sport some right kind of hairdo that will complement the season by making them stunning at the same time. In general, the prettiest styles of hair in the summer months are those that are actually unfussy and not too contrived. Very elaborate as well as formal hairdos only don’t fit in with the relaxed vibe of summer, particularly at an outdoor wedding. On the other hand, throwing the hair up into a ponytail to keep it off your neck like a lot of us do on the typical steamy August afternoon does not exactly cut it for a wedding. The answer lies somewhere in between, neither too sloppy nor too formal as well. So, choosing the several kinds of braided hairstyle and buns along with the pretty flower or another hair accessory can be the ideal option for you as well. Trying some classic hairdos will be able to endure any type of summer weather beautifully. Appear extravagant with the Half Up Braided Hairstyle. Take some of the layers of hair from both the sides at the front of your head and then finally pin then towards the back for the half up. After that just make sure to provide the curly texture to the remaining hair. If you have a medium, blonde and thick hair, you can surely try this amazing hairstyle on the wedding day. It gives you absolutely classy and pretty look. In case you have a beautiful wavy hair of medium length, you have the choices of going for any styles. But the Wavy Hair with Braids will mainly look good if you have the longish face. Along with the strands neatly tied in the side of your hair as a braid shape, you can curl the rest of your hair in the wave shape. You can also fashion apart to just fall along the length of the face. Girls with the long or medium blonde hair can promptly try the style without any hassle. Brides always opt for the soft, shiny and silky Middle Parted Soft Waves to look classy, elegant and gorgeous on their wedding day. If you basically have shoulder length hair and you want something entirely off the books, then this is the right hairstyle for you. To try this beautiful hairstyle, you have to do a middle parting first and then take small strands from both sides of the hair and tie it up loosely. Then leave the rest of your hair and curl it up to fall along by the side of your head. If you wish to look like the bohemian princess on your wedding day, then all you require asking for the Boho Braided Crown. This particular hairstyle can be done in the long or medium length hairs. So, to try this beautiful hairstyle, first, fashion a braid out of the hair and then loosely tie this at another side of the head as well. This particular look will make a pretty head-ring made of your own hair. If you want, you can also add some loose curls in the front strands as well. If you are opting for the top-notch hairstyle to sport on your wedding day, trying half up Half Down Hairstyle can be your choice as well. 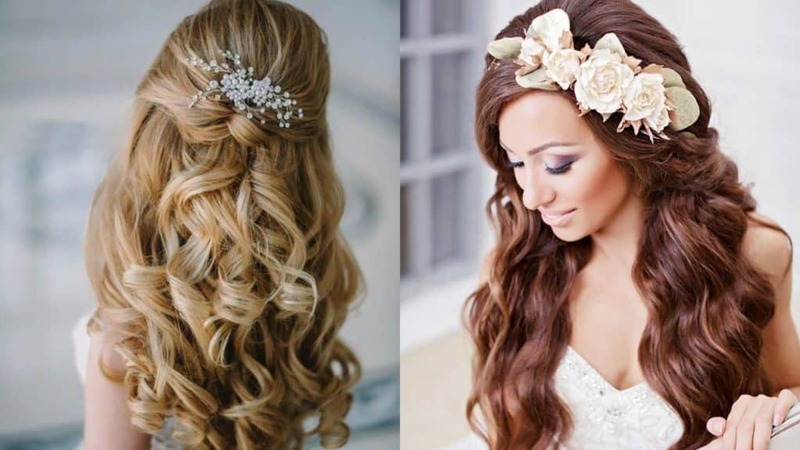 Get the best of both worlds on your wedding along with this pretty hairstyle and also with an elegant hair accessory. The lifted part of the hair at the front will enhance the grace and the flowing locks at the back will provide naturalness. Tying out your hair by taking two loose strands from two sides with a classy accessory will give you elegance. This is a proper instance of the little uneven but stunning look, and if you desire to spot the natural look, then Loose Curls with Flower Headband can be your perfect option to try. Make a side part of your blonde and thick hair and then leave the entire hair fall along over your shoulder. But adding an eye-catching Flower Headband on your loose curls will be the prime attraction to look at. The thick and little messy look provides you the charm on your wedding day as well. Women who actually have the medium or long blonde hair can go for the style, which is the ultimate combination of a lot of individual hair arrangements. The Braided Updo Hairstyle is one such style, which will make you the center of attraction. Even if you are not the bride, then also braid, which goes across the head, will fetch many competent. To create this stunning hairstyle, leave little strands on the sides to just increase the appeal and charm as well. The flower crowns are in fashion. This has turned out to be extremely common for the people to sport such looks at weddings. As everyone knows the fact that flowers are used widely in the weddings and brides love to use as their hair accessory too. Go for the simple half up hairstyle. Enhance the few bright colored flowers only to obtain the fashionable and elegant look. Take a few portions of your hair and tie it up on the back sides with a beautiful flower crown. One of the most well-liked Updos of all times is the low bun updo. So, if you have a medium blonde hair, then trying the Updo for Medium Hair hairstyle can be perfect for you. This look is actually considered one of the classics and every person who wears the Updos should try this type. You have to pull back all of the strands on the back side of your head and then tie it up. You can also add the rusty flower on the bun to get a proper bridal look. But this hairstyle is little messy and uneven to look at. Apart from the flowers, the pearl accessory also looks extremely beautiful and stunning on a bride. Women also use the pearl accessory to provide an extra edge to their look. So, to stand out ravishing on your wedding day, try the Intricate Plaits with Pearl’s hairstyle and add the eye-catching accessory on the back side of your head by making a messy braid. It gives you an enticing look. Go for this look if you love experimenting with different styles. If you want an entirely simple style, then go for braiding your hair. Braiding your hair offers you a clean, neat and also a traditional look then going with a braided style should be your first choice. If you want to add the trend quotient to your look, then put in the bit of messiness to your style. Take your entire hair together and make a side braid and finally tie it up neatly with bobby pins at the side of your head. Braiding your hair updo has to turn out to be remarkably familiar with this look is an outstanding choice for weddings. People also are inclined to adjoin a bit of messiness, and uneven look to this style and this is the ideal style, which mixes up the tradition with fashion. To create this look, you have to take some strands from the side of your head and create a beautiful braid and then add a flower accessory and pin it up with the rest of your hair. Milkmaids, during the medieval years, basically used to do their tresses in the particular fashion. Some brides opt for this Milkmaid Braid Updo only to sport the gorgeous and striking look. To make this style, create a thick and polished braid and then place it like a headband in the middle of your head. To give an entirely exquisite and eye-catching look, you can add some right type of flower accessory. If you have medium or long hair, you can never go wrong with Rolled Updo Hairstyle for a wedding day. This style will give you a neat and clean look. If you want to try this style, you have to brush back your hair and then make a little-rolled bun at the lower back of your head. This polished, silky, soft and shiny look will add some more cool quotient to your personality. The Chignon Updo Hairstyle is an accessible style, which brides have been opting for a long time. This is particularly a traditional hairstyle, which gives beauty of the bride’s face by not allowing any stray strands to fall on her face. Take few curls from the side and create a messy little bun at the lower back of your head by jotting down the hair together. The uneven hairstyle will surely add some elegant and classiness to your personality.